My Very First Blog: Beware Of The Hungry Ghosts! 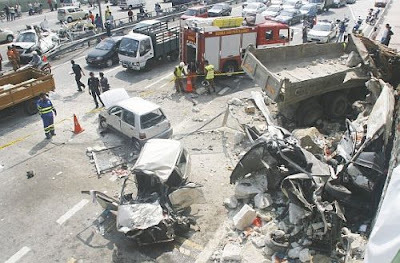 By now you may have already heard or read the news about the lorry that rammed into seven vehicles on the Cheras-Kajang Highway last Friday, killing two people and leaving five others in critical condition. I shuddered at the thought. Reminds me of a scene from Final Destination. Look at these photos of the accident taken from Star Online. 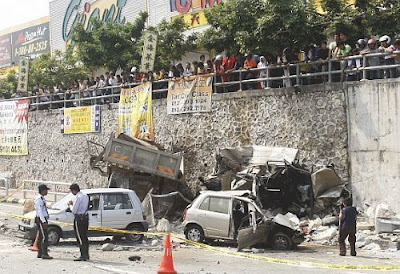 It seemed that the lorry driver had lost control of his vehicle and hit a motorcycle, killing the motorcyclist on the spot, before jumping the divider and crashing onto oncoming vehicles on the opposite side of the highway. Dear God! Does this have to happen during this dreaded month? You know what I’m talking about, especially if you are Chinese. Call me superstitious, but I noticed such accidents happened a lot during the “Hungry Ghost” month. If you really take notice, there seems to be more people dying during this time of the year. At least that’s what I observed every year without fail. Maybe I’m being superstitious, but don’t you notice there seems to be more funerals taking place around your neighbourhood? For those of you who think it’s a total nonsense and ghosts don’t exist, what’s more hungry ghosts, well maybe you are right, then again you may be wrong. Who the hell knows? But Hungry Ghost Festival is still very much celebrated by the Chinese in Malaysia in this modern age. This is evident from the sight of many food offerings and burning of joss sticks by the road side during the night. Even if you don’t believe in ghosts, do not under any circumstances stand too long at these road side offerings as you are actually in the company of ghosts! Or worse, do not attempt to steal or take any of the food being offered or you may just incur the wrath of the hungry ghosts! The ghosts may just follow you back to your house! Now don’t say I didn’t warn you! OK, time to end my post here. As I was writing this post, I was interrupted by a sharp clanging sound coming from my kitchen. Needless to say, I rushed to the kitchen and found my stainless steel ladle on the floor. How did it get there?! I’m shaking a little. If that’s not a sign, I don’t know what is! So very sorry to end this post prematurely, there’s more I want to talk about, but clearly not tonight. I’m still shaking. Bye for now. I hope they reprimand the reckless person(s) responsible for this. This is scary, my colleague also canceled plan to pulau pangkor because of ghost festival. If you have any plan during this month, do it after the ghost festival. hehe..
During this month, just be alert and go out less at night. Yet again stupid drivers on the road all the time!! creepy, there are some spot area which take notice about it. Always feel a little uneasy this time of year. Stay safe! my bug life, unfortunately the person responsible ie. 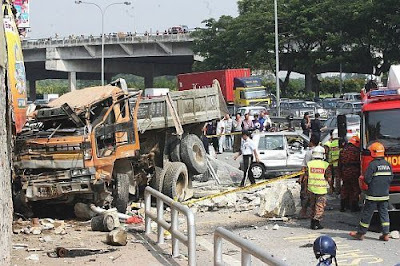 the lorry driver died in the accident. Not sure how he lost control of his lorry though. May or may not be his fault. You know what month it is! faerie-lady, I didn't know that's a regular spot for accidents! Thank goodness your dad's accident is not serious. Yes just 1st day already started! bernardc, the cause of the accident may not be the driver himself! sherry, yes be careful of certain accident prone spots. cc, yes good advice to everyone - stay safe! This is horrible. With that big lorry ramming into those small cars, it's a surprise that there are survivors. Oh, I believe in ghosts. I've seen quite a lot of them since childhood. This 'gift' runs in the family. bengbeng, you mean can see those things? I just read your blog on your ghostly experiences - now I know what happened to you at six years old! Tell me any new paranormal events this month - I don't want to miss your story!